Craig Levein has been confirmed as the new Scotland national coach after he signed a contract at Hampden believed to be for four-and-a-half years. Confirmation of his departure from Dundee United was delayed because snow held up the journey from his Fife home. "As a proud Scotland fan, it is a dream come true to take charge of the national team," said the 45-year-old. And Levein said players who ended their Scotland careers under George Burley would be considered for selection. Kris Boyd and Lee McCulloch both ruled themselves out of selection under Burley, who was sacked in November. Meanwhile, their Rangers colleagues, Allan McGregor and Barry Ferguson, now with Birmingham, were axed from the international squad because of a breach of discipline. "My remit as manager is to try to qualify for the next time round in the European Championships and I will not be ruling out any player," said Levein. "If there are people who don't want to be involved then so be it, but I will be picking the best players available." United gave Levein permission to speak to the Scottish Football Association on Thursday and was offered the job following a meeting with his future employers on Monday. Confirmation of his appointment was delayed following protracted negotiations with his club about the £250,000 believed to be written into his contract as compensation for the Tannadice side. "Not much of a secret was it, really?" the early bookmakers' favourite told the awaiting media. "I really am thrilled to be here. "When I first got word of the SFA being interested in me being the manager, obviously I was very excited indeed. "It's difficult to express just how proud I feel being a Scotsman and having followed the national team all my life. "Today was a little bit protracted, but so what? How could you turn this job down?" Levein, who had been at Tannadice for three years, leaves behind assistant Peter Houston in charge of the Scottish Premier League club as caretaker manager but expressed hope that the pair might be re-united. "I still hope very much that Peter can come along an assist me on match days," said Levein, pointing out that there was no full-time coaching role available. "But what we have established is that there is a place for a full-time scout to scour Europe and watch teams we're playing against." Levein said he hoped to achieve more than just put a winning senior team on the park. "There is a malaise round about the game just now and I think we need to change attitudes more than anything else and be a bit more positive about what we are doing," he said. "We need to instil a bit more pride and passion and even protect our country when people talk about us, standing up for Scotland when things have not gone so well." Before talking to the SFA, Levein had expressed a desire to become involved in more than just picking the senior squad and he said he hoped to help improve standards all the way down to youth level. "One of the main things for me was the chance to get involved not just in the running of the national team but also to have an input into things that were happening behind the scenes at the SFA," he said. "I'll be in here and it'll be easy for me just to have a look at how things are set up and see if there's anything that I can suggest could be done differently or better." SFA chief executive Gordon Smith, who stressed that Levein was its unanimous choice, confirmed that the new national coach would have an input at youth level. "Craig's got a lot of ideas on the development of youth players, as I have, and other people within the organisation have," he said. "We have a very progressive system within the SFA." Asked if he was confident Levein could succeed where Burley had failed, Smith said: "When we appointed George Burley, we obviously felt George could succeed. "It's the same aspect with this appointment, too, because we do think Craig is the right person for the job." Smith refused to discuss the question of compensation, United chairman Stephen Thompson having expressed his fury with the way the national body has carried out negotiations. "I've just been speaking with Mr Thompson, so I'll leave it there," he said. 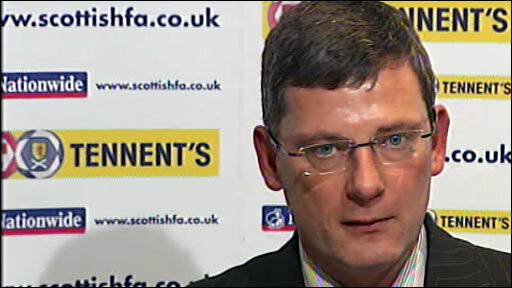 SFA president George Peat admitted he and Levein, who has had his run-ins with the SFA, especially over the quality of referees, had not always seen eye to eye. "I've never been a yes man, he's never been a yes man," he said. "So we'll get on like a house on fire." Levein, capped 16 times for his country, began his management career began at Scottish Football League club Cowdenbeath in 1997 and, three years later, he moved to Hearts, the team with which he had starred as a central defender. His next move was to Championship side Leicester City in 2004, but that move turned sour and he was sacked in January 2006. Now, having found his managerial feet again and having impressed with Raith and United, he is the man Smith and Peat believe has the wealth of experience necessary to improve Scotland's fortunes after their failure to qualify for next summer's World Cup finals.